University of Johannesburg, University of Pretoria. 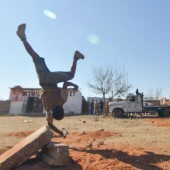 Slovo Playground is one of several initiatives of the Slovo Park Project , which began as a small research project in the University of Pretoria’s Architectural Honours Year to expose the students the issues faced by South Africa’s urban poor. The process culminated in a joint a built project with not only a physical product, but many intangible outcomes that extended beyond simply ‘another community project’. 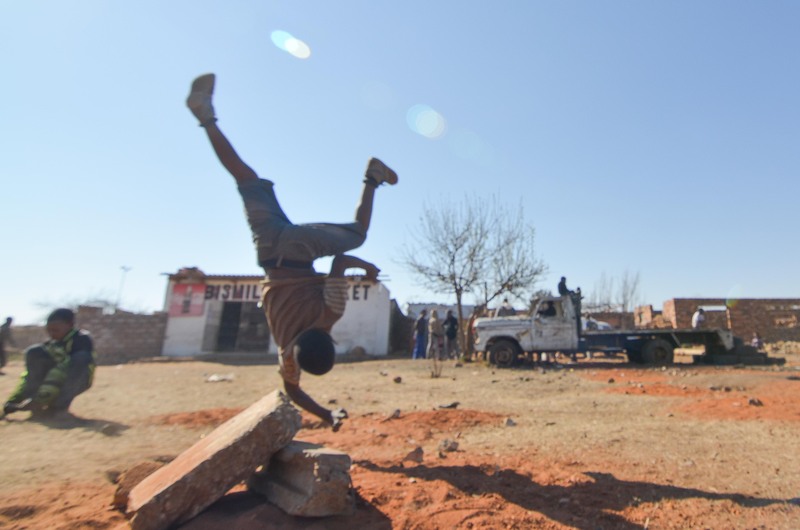 The playground was conceived to address the play needs of the children of Slovo Park with a robust, public playground that would provide play support for the Slovo Youth. 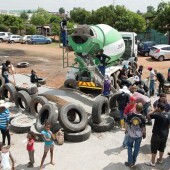 The Slovo Playground was conceived during the 2013 student engagement with Slovo Park. The idea of the playgound design/builds was chosen due to the need of the 400+ Slovo Park Children who have few spaces to be safe and play. The University of Pretoria students began the process of an intense 8 week research, design and analysis process. 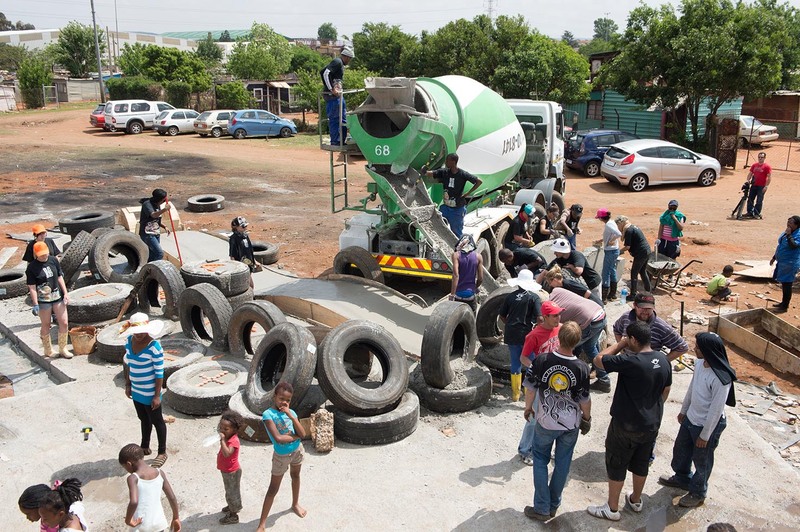 The were joined by the University of Johannesburg students accompanied by Denver Hendricks and Yusuf Chothia who faciliated the design/build and construction of the Playground with the support of the Cement & Concrete Institute’s donation of surplus concrete. The Playground was designed to be robust, allow for safe play and child gathering but still allow for alter growth and development. 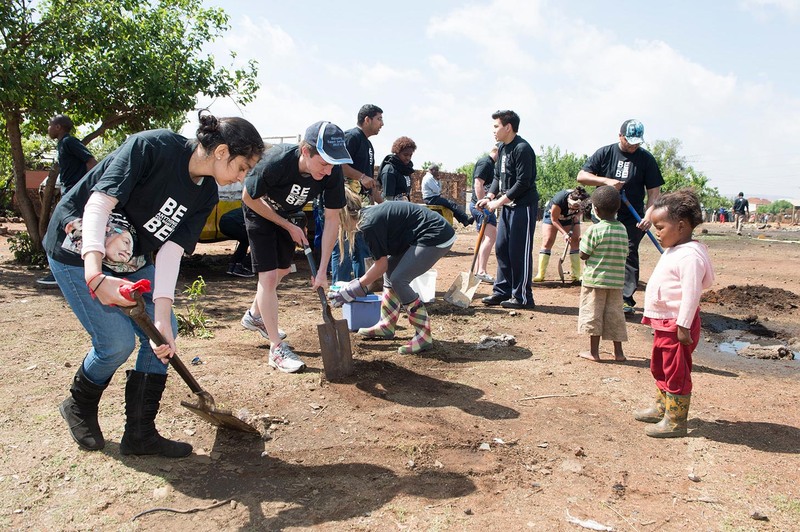 The Playground is still under construction under the incremental process outlined by the students, and is currently being researched with a new group of students with the children of Slovo in 2014. University of Johannesburg: Megan Louise Wilson, Jamela Mkansi, Heidi Lu, Jade Botes, Isabella da Rocha, Tebogo Kgatla, Siphiwe Siphiwe, Tebogo Mokgwetsane, Natasha Celestine Ramos, Mohau Moidi,Kerry Trebble, Kagiso Teke, Lerato Botlhoko, Aweni Nenongwe, Mikhael Thulani Maluleke, Gareth How, Cheslin Erasmus, Crystal Angela Francis, Dewald Skiepy Le Roux, Dashan Munsamy, Roland Britz, Rosalie Ferreira, Armand Barnard, Ricardo De Sousa, Corrie Smit, Anneke Wallendorf, Aisha Balde, Shawn Constant, Simone Pretorius, Lual Aluel Kuol Makuach, Ruben Smit, Rudelle Bezuidenhout, Kyle Blake, Tebogo Ntsoane, Kholokazi KhLz Ngoma, Vikash Mithal, Muyi B. Adegun, Dipna Morar, Kabelo Kay’b Matlou, Wandile Mkhwanazi, Barry Crouch, Travis Lee, Binaica Morar, Kagiso Bokaba. University of Pretoria: Alex Becker, Muhammed Dawjee, Nick Randall, Taryn Leefrink, Adam O, Micheal Duvel. How can a playground be designed and constructed to be safe, robust and completely accessible in an informal settlement? Architecture, Days, Permanent, Initiated by institution, Undergraduate, Self-funded, Semi-permanent, 11-50, Sponsorship, Curricular, Students with tutor, Johanesburg Univ., Johannesburg, Pretoria Univ.